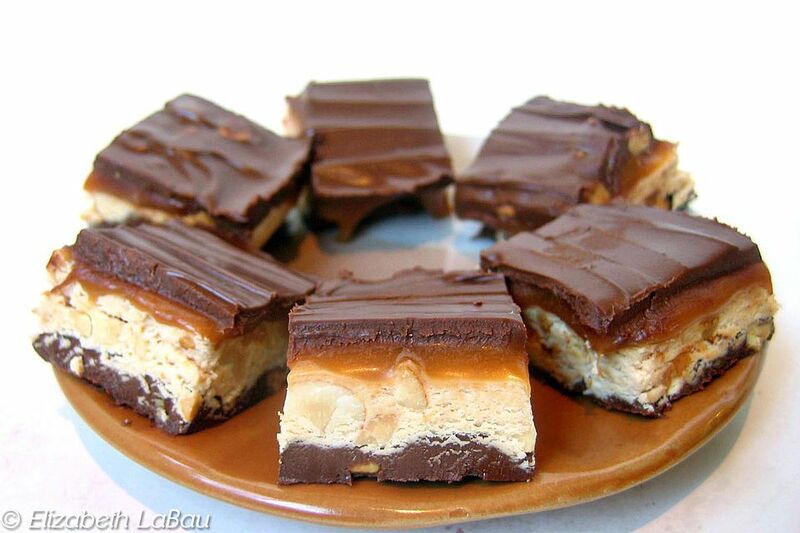 Snickers Fudge has all the elements of the classic candy bar: think thick layers of chocolate fudge, gooey caramel, salty peanuts, and plush nougat. All of the flavors and textures work wonderfully well together. Because of all the layers, this fudge takes a little time and planning, but the final result is delicious and totally worth it. Prepare a 9 x 13 pan by lining it with aluminum foil and spraying the foil with nonstick cooking spray. Place the chocolate chips, butterscotch or peanut butter chips, and 1/3 cup of peanut butter in a medium microwave-safe bowl. Microwave until melted, stirring after every 45 seconds to prevent overheating. Once the chocolate mixture is melted and completely smooth, pour half of it into the prepared pan and smooth it into an even layer. Set aside the remaining chocolate mixture for later use, and place the pan in the refrigerator to set the chocolate while you prepare the next layer. Place the butter, sugar, and evaporated milk in a medium saucepan over medium heat. Stir until the butter is melted and the sugar dissolves. Stir occasionally until the mixture comes to a boil. Once it reaches this point, stir continuously while boiling for five minutes. After five minutes, remove the pan from the heat and stir in the marshmallow cream, remaining 1/3 cup of peanut butter, and the chopped peanuts. Spread this over the chocolate layer in the pan, taking care to not disturb the chocolate and to spread it in an even layer. Return the pan to the refrigerator to set the peanut layer. Once the caramel is melted and smooth, pour it over the peanut layer in the pan. Smooth it into an even layer, and return the pan to the refrigerator to briefly set the caramel, for about 10 minutes. If the remaining chocolate-peanut butter mixture has stiffened, microwave it briefly until it is melted and smooth. Pour the chocolate over the caramel and spread it into a smooth, even layer. Allow the fudge to set in the refrigerator for at least 2 hours. Once set, remove the fudge from the pan using the foil as handles. Cut the fudge into small 1-inch squares, and put them in paper candy cups to serve.